This ongoing project is providing design services to upgrade portions of the University of Binghamton's athletic fields to meet NCAA Division 1 requirements. Shumaker Consulting Engineering & Land Surveying, P.C. (SCE) is providing survey/mapping and Stormwater Pollution Prevention Plan (SWPPP) services. Design tasks included Stormwater Phase II Notice of Intents and Program Verification; schematic design, design manual and construction documents of the phases for the SWPPP. Survey tasks include field data collection, and preparation of digital mapping to reflect current conditions. This project provided design services to upgrade portions of Binghamton University’s athletic fields to meet NCAA Division 1 requirements. Shumaker Consulting Engineering & Land Surveying, P.C. 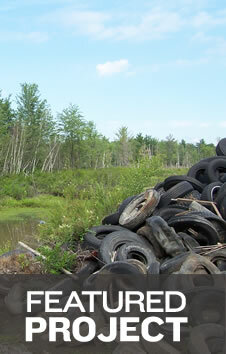 (SCE) is providing survey/mapping and Stormwater Pollution Prevention Plans (SWPPP) Services. Design tasks included Stormwater Phase II Notice of Intent on the written portions of the SWPPP. Survey tasks included field data collection, and preparation of digital mapping to reflect current conditions. Shumaker Consulting Engineering & Land Surveying, P.C. (SCE) provided civil engineering and site design services for a 4,000 square foot addition to the existing armory building. 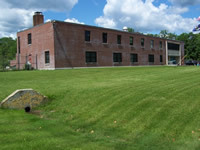 Leeds Armory is a secure, historic facility operated by the New York State Division of Military and Naval Affairs (DMNA). The design for connection to a municipal water source required horizontal directional drilling under NYS Route 23, as did the design for relocating electric power conduit and communication utility lines onto the south side of NYS Route 23. SCE coordinated contact with public utility agencies to obtain approval for utility relocations and NYSDOT highway permitting. SCE was responsible for environmental review of the site which included wetland delineation and coordination with the ACOE. SCE was also responsible for an investigation and design for asbestos-containing materials and lead. SCE performed Water Quality and Water Quantity Calculations and designed temporary soil erosion and sediment control measures. The design for treatment and retention of stormwater was prepared in conformance with the NYSDEC Stormwater Design Manual. They included a stormwater detention pond designed to address conformance with Stormwater Phase II Water Quality and Quantity requirements. 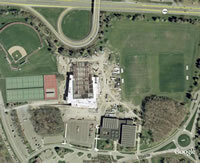 This project addressed the design and construction of a new academic building at SUNY Morrisville. The new facility is approximately 12,000 SF, with capacity for expanding classroom space at a future date up to an additional 4,600 SF of floor area. The site includes an access driveway and 16 new parking spaces. The scope of the project included a comprehensive site survey that included location of existing utilities and topographic survey in support of the design effort for a new campus building. Shumaker Consulting Engineering & Land Surveying, P.C. (SCE) provided survey/mapping services, as well as design of site utilities, which included water, sanitary, and storm sewer systems. SCE also provided Stormwater Pollution Prevention Plan (SWPPP) services, which included the redesign of an existing “infiltration pond” to a wet pond detention practice. Temporary erosion and sediment controls for the building and the pond reconstruction were designed by SCE. Survey tasks included field data collection, and preparation of digital mapping to reflect current conditions.